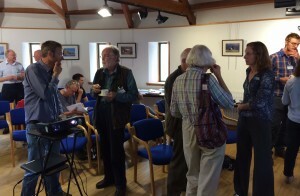 Goose & Swan Monitoring Programme volunteers attended the first GSMP Counters’ Conference at WWT Caerlaverock on 6 September 2014. The day featured a series of talks by programme organisers, volunteers and guest speakers and highlighted the immensity of volunteer effort that has made the programme possible over the years. WWT’s Carl Mitchell (GSMP project manager) opened the conference with an overview of goose and swan monitoring in the UK, including how the data collected are used – such as in the designation of protected sites – and emphasised the importance of the work carried out by the GSMP network. We heard from BirdWatch Ireland’s Helen Boland on goose surveillance in Ireland and the difficulties encountered monitoring Iceland Greylag Geese there in winter. We were also privileged to be joined by Arnór Þórir Sigfússon who gave us an interesting insight into the monitoring of Pink-footed and Greylag Geese in Iceland and the role of aerial surveys in finding Iceland’s well dispersed geese. Icelandic-breeding Goose Census (IGC) Local Organiser Allan Brown gave us a glimpse of the dedicated coordination of winter goose counts in Fife, Lothians and the Borders, and the changing trends in goose numbers in the region. And finally, WWT’s Larry Griffin spoke on goose counting on the Inner Solway and how the latest tracking technology is helping us to answer questions on local scale movements and the annual migrations of goose species. It was marvellous to see like-minded participants from all aspects of the GSMP meeting to talk about their work. A very big thank you to everyone who attended, particularly to all the speakers for their excellent contributions.